The United States, United Kingdom and the European Union have expressed concern with the lack of due process in the trial of former President Mohamed Nasheed, who was convicted of terrorism charges and sentenced to 13 years in prison last night. “Despite the calls from the international community for due process to be followed, we are concerned that the former President’s trial has not been conducted in a transparent and impartial manner or in accordance with due legal process,” said UK Foreign Office Minister Hugo Swire in a statement. He added that the UK would be watching the appeal process closely. “I recognise that this outcome will be deeply worrying for many in the Maldives. I therefore urge calm across the Maldives and encourage all political parties to act with moderation, restraint and within the bounds of the law,” Swire urged. The US meanwhile expressed concern with “the apparent lack of appropriate criminal procedures during the trial”. 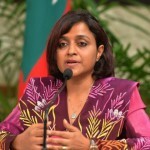 “We are particularly troubled by reports that the trial was conducted in a manner contrary to Maldivian law and Maldives’ international obligations to provide the minimum fair trial guarantees and other protections under the International Covenant on Civil and Political Rights (ICCPR),” reads a statement by the US embassy in Colombo. “This includes the denial of legal representation to former President Nasheed during the first hearing and concerns regarding the lack of impartiality and independence of the judges. The EU statement also noted that due legal process was obligatory for the Maldives under the ICCPR. “Should the conviction be appealed, the appeal process must be fair and transparent with former President Nasheed being accorded all his rights, including adequate access to his lawyers,” the EU stated. Moreover, President Yameen has declared that foreigners would not be allowed to meddle in domestic affairs and the ruling Progressive Party of Maldives (PPM) has condemned the international community’s “hypocrisy and double standards” with regard to Nasheed’s trial. “Amnesty International condemns the conviction of Mohamed Nasheed to 13 years in jail by judges who were state witnesses during an earlier investigation of this case. This trial has been flawed from start to finish, and the conviction is unsound,” said Richard Bennett, Amnesty International’s Asia-Pacific Director. “Rather than responding to international calls to strengthen the impartiality of the judiciary the government of the Maldives has proceeded with this sham trial for political reasons”. Amnesty noted that the opposition leader was denied legal representation at the first hearing of the trial and that at latter hearings his lawyers were not given sufficient time to prepare his defence. Nasheed’s conviction last night received widespread coverage in international media and was greeted with outrage by several prominent figures who have called for his release. Sir Richard Branson, founder of Virgin Group, called the outcome of the trial “beyond a joke” and declared he would not visit the Maldives until the opposition leader was released. Comment: Is privatization only happening in the Maldives? "Urge everyone worldwide who believes in freedom to boycott the Maldives until true democracy is restored" - Richard Branson. That speaks for itself and is the clear message for all friends of Maldives who love peace and democracy. Boycotting Maldives will not be helpful. What can be done should be done within the country by the local people. Who will be hurt 'most' if no tourist comes to our country? It will be the common people. Honestly, I can't afford to feed my family and survive if i lose my job. Please leave the fragile tourism Industry out of politics. I stand with President Nasheed and I am against the corrupt judiciary. There should be another way to tackle this serious issue without using collective punishment! Hope Minivan news will post my comment. Agree with @nasir. Get em where it hurts - i.e. in their pockets, even if it hurts us too. If they want to act like pariahs, then pariah treatment it will be, till they get the message. Back to the nursery it is till they grow up. The journey ahead is long, but with hope, we'll get there one day. Firm in the faith and acceptance that it will take longer than any of us want it to be, for we are human. We cannot be taken for this unwelcome ride forever, not by folks with less than 50% of our vote and not by thugs who call themselves patriots and are getting away with all sorts of inhuman behaviour in their consistent self-delusion. Young boys were murdered by this same regime, Nasheed stood up for them and for what's left of our once gentle nation. Hope must endure:all this suffering cannot be in vain. We, a tiny country, know we are all connected. There must be a more peaceful way forward and that too must be explored in parallel. We all need to soul search, but first of all we need to find our soul. During yameens reign.so either the government has to step down due to public pressure (unlikley)....or will have to vote them out.after all yameen WAS elected..even by a small margin. What is true democracy? When MN did all undemocratic things where were you? So, you are fighting for a person, not for a course. What was ok when MN did is not ok for you when YAG. This is not correct, this is not genuine. You all should have spoken the same language MN was acting like a dictator, then we could have possibly avoided what has happened today. i say again there is due process but the defense lawyer of MN QUIT & choose to reason in the street, so no one defend MN in the court. where was Richard Branson , when Nasheed kidnapped the Judge ? Does it mean kidnapping is basic principle of democracy ? Where was Richard Branson , when Nasheed arrested President Yameen ? was he sleeping then ? Richard Branson, thought we don't have filthy money as your, but we are proud of what we earn and we don't need you support and your voice to exercise our democracy. We don't need biased and unethical people like you to meddle with our politics. We request you to bring a proper democracy to you own country United Kingdom and eradicate the racism in your country. We urge you to spend at least 10% of your filthy money on advocating the basic rights in your country, and remove the racism in your country. All the good peoples should stand together to fight against the evil force. If the good people are not strong enough then the evil force will capture the power Then only the God can save the country. So all good people stand together and fight against the evil force to win the game. Its very important for the people country and your kids. So be ready to sacrifice your self. @Hero: Where were you when your judge paved the path to the murder of Maldivian youths? Where were you when your judge abused children in court? Oh yes, you were counting your blood-soaked earnings. Your judge is a threat to all Maldivians, and you may be one of the drug dealers he let go free.